The number of people out of work in Northern Ireland has hit a record low. 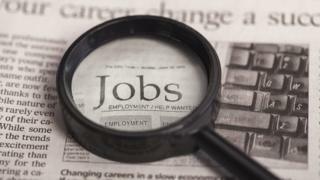 Latest official figures show the number of people employed is about 860,000, up 16,000 over the past three months. The unemployment rate fell to 3% - down 0.5% on the previous quarter. That is lower than the UK rate of 3.9%, the EU rate of 6.5% and the rate in Republic of Ireland of 5.3%. But figures suggest the people who are still out of work, have been out of work for much longer. More than half (56%) of those unemployed in NI were long-term unemployed (unemployed for one year or more), compared to 26% in the UK. The official figures show the economic inactivity rate - the number of people aged 16 to 64 not working, not seeking or available to work - decreased over the year to 26.6%. The employment rate in Northern Ireland now stands at 71.2%, which is below the UK average of 76.1%. The Labour Force Survey is compiled by the Northern Ireland Statistics and Research Agency. It also shows there were 2,357 confirmed redundancies in the most recent 12 months - 24% higher than in the previous 12 months. The number of proposed redundancies in the last month is the highest reported since late 2015.